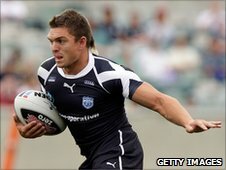 Scotland's European Cup hopes have been boosted by the return of former captain Danny Brough. The 27-year-old Huddersfield Giants half-back led the Scots in the 2008 World Cup but later switched his allegiance to England. However, he was left out of new England coach Steve McNamara's 37-strong training squad earlier this season. And after performing an about-turn, Brough will next week be named in Scotland's 25-man squad. Scotland meet Wales in their opening match at Old Anniesland, Glasgow, on Sunday 10 October before facing France in Toulouse on 16 October and Ireland in Dublin on 24 October. The winners of the tournament will join Australia, New Zealand and England in the 2011 Four Nations Series. "I'm delighted that Danny is on board," said Scotland coach Steve McCormack. "He's been an integral part of the Scotland set-up since I've been involved and I know that he's very keen to represent his country in this tournament and be part of the squad as we build towards the 2013 World Cup. "There's a big prize at stake for winning this year's Alitalia European Cup and you can bet that Scotland will be in the running for that place at rugby league's top table."